When the four-story brownstone rowhouses at Nos. 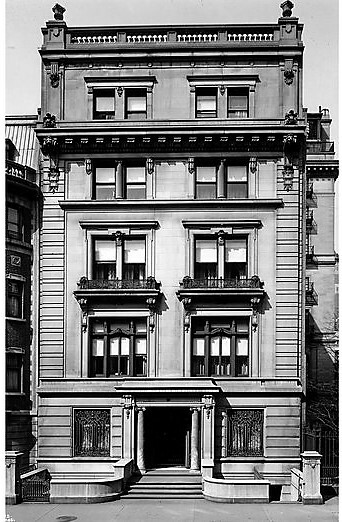 11 and 13 West 53rd Street were built Manhattan's wealthiest citizens were still, for the most part, several blocks to the south. At 23- and 20-feet wide, respectively, the residences were nonetheless fashionable. 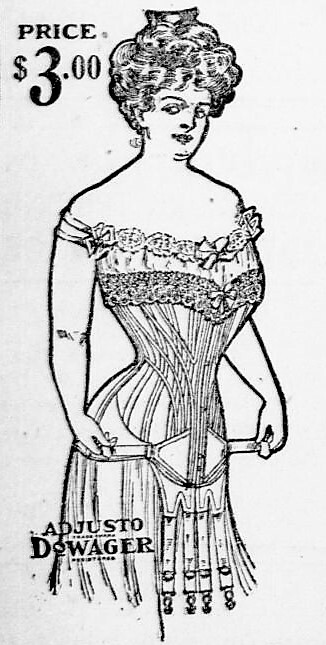 In the 1870s and early '80s No. 13 was the home of Harriet and James Hubert McVicker. 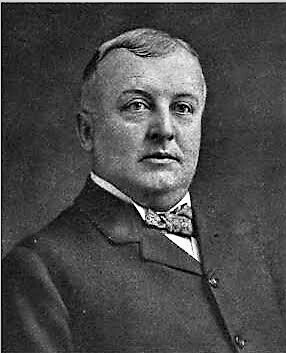 James had been the proprietor of McVicker's Theatre in Chicago. Harriet's actress daughter by a previous marriage, Mary Frances, married the internationally-famous Shakespearean actor Edwin Booth on June 2, 1869. Mary Frances Booth died in the 53rd Street house on November 13, 1881. In the meantime, William Barbour was amassing a fortune. Born in New York City on September 9, 1847 to Thomas and Sarah Elizabeth Barbour, he was educated in a private school in Paterson, New Jersey, where his family had relocated when he was still a child. Their move made sense since Paterson was the center of the area's textile mills. The family's connection to the industry went back to Ireland there John Barbour established a flax spinning mill in 1768, and a linen thread manufacturing factory in 1784. William's father immigrated to the United States around 1840. He and his brother, Robert, founded the Barbour Flax-Spinning Company in Paterson soon afterward. After graduating high school, William was sent to Europe for three years to "acquire a familiarity with the languages of the old world," as explained by Nelson's Biographical Cyclopedia of New Jersey in 1913. He joined the family firm upon his return and also became active in politics. Beginning in 1884 he was a delegate to every National Republican Convention. He became close personal friends with William McKinley. Following John W. Griggs election as Governor of New Jersey in 1896, Barbour was appointed a member of his personal staff, earning him the title Colonel. On November 8, 1883, he had married Julia Adelaide Sprague. The couple would have four sons: Thomas, Robert, William Warren, and Fritz Krupp (he was named after the famous Prussian gun maker, but preferred the Anglicized "Frederick"). As the turn of the century approached, Barbour was involved in a staggering number of businesses. He was president of the Linen Thread Company, the Barbour Brothers Company, the Paterson Central Electric Railway and the Trust Company of America; and was a director in 13 others. 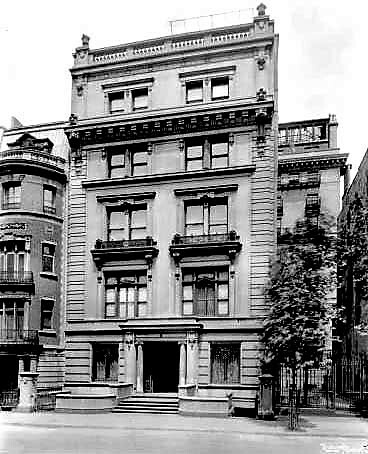 While still firmly ensconced in New Jersey (the family had a mansion in Paterson and a summer home in Monmouth Beach), Barbour began planning a Manhattan residence as well. In the first week of March 1901 he purchased No. 11 West 53rd Street from Henry D. McAleenan, and No. 13 from Mrs. W. J. Jarrett. Barbour paid $100,000 for No. 11 and $80,000 for the slightly narrower No. 13. In reporting on the sale, the Real Estate Record & Guide noted "it is said [he] will erect a handsome dwelling." 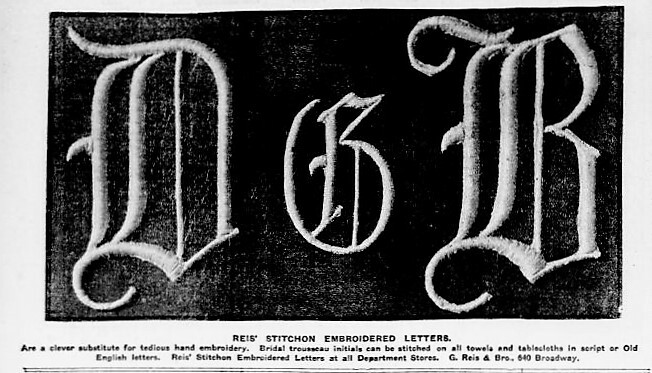 Before the end of the month mansion architect C. P. H. Gilbert was working on the design. On March 30 the Record & Guide noted "the front will be of light buff limestone, and will have an electric elevator and all modern appliances. Work will start immediately." 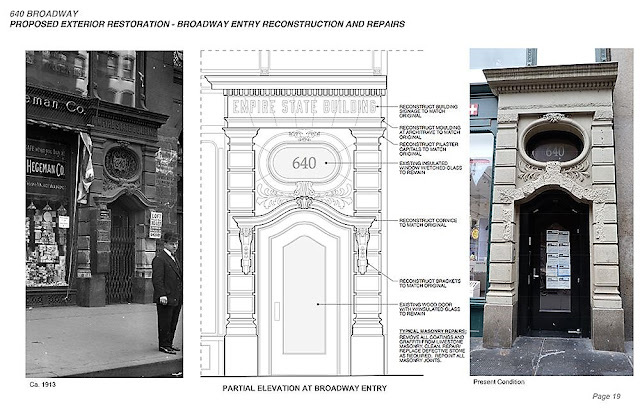 The New-York Tribune added "The plans call for a complete house in every respect, and will have an electric plant, elevators, etc." The inclusion of the electrical plant meant that the Barbour family would not have to depend on the routinely unreliable service from commercial electricity suppliers. Gilbert's plans projected the construction cost at $95,000. Including what Barbour had already spent on the properties, the total cost would be equivalent to about $7.86 million today. Construction would not be completed until 1903--the delay due in part to the plasterers' union strike in October 1902 as the finishing interior touches were being done. 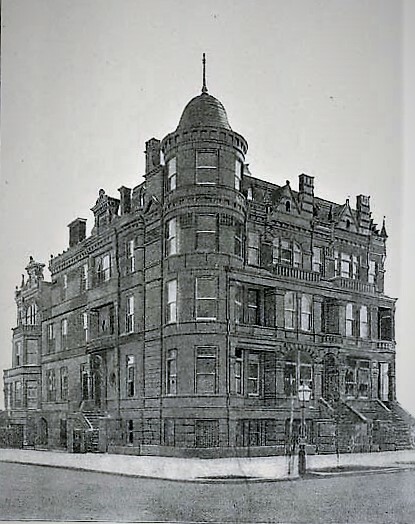 Gilbert had produced a princely five-and-a-half story residence with restrained Beaux Arts elements like the third story stone-and-iron balconies, the fourth floor cornice and the regal balustrade topped by stone urns along the roofline. The ground floors of American basement plan homes were never intended for entertaining. Here was a reception room where guests would leave their cloaks and hats. Off the grand "main hall" in the Barbour house was the billiard room, and to the rear were the kitchen and servants' dining room. Guests would immediately be shown to the second floor, or piano nobile. Here was the library, the drawing room and the dining room. The full width of the third floor overlooking 53rd Street contained the bedroom and sitting room of William and Adelaide. To the rear were two smaller bedrooms. Additional bedrooms were on the fourth floor. 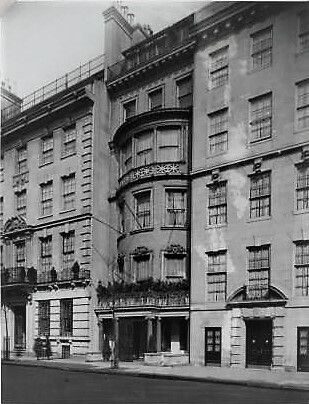 The fifth floor contained six servants bedrooms and the "attic" floor, hidden behind the balustrade, contained was was termed the "servant's dormitory." It was outfitted for two additional servants. C. P. H. Gilbert turned his attention to interior details as well, designing the mahogany case for the pipe organ in the second floor hall, for instance. Pipe organs were de rigueur in turn-of-the-century mansions. While most millionaires hired professional organists, a few like Frank Woolworth, enjoyed playing the instruments. The Barbour mansion, like the neighboring homes, was filled with costly antiques and artwork. Medieval tapestries, French antiques, and marble and bronze sculptures decorated the rooms. In the main hallway, for instance, hung four 18th century portraits while Italian and Flemish Renaissance furniture lined the walls. Equally impressive was the grand piano which sat in the main hall. The Steinway Brothers-manufactured instrument was housed in a magnificent case, designed by Sir Lawrence Alma-Tadema. It was commissioned by millionaire Henry G. Marquand and purchased by William Barbour at the Marquand estate sale in 1903. In a letter to Marquand Sir Edward J. Poynter, President of the Royal Academy, said "I have no hesitation in saying that it is the most beautiful piece of work, both for the design and the workmanship, that I ever saw. In fact, I do not believe that anything has ever been done equal to it." The Barbours' eldest son, Thomas, was enrolled at Harvard when the family moved into the house. He would see little of the mansion. He graduated in 1906 and married Rosamond Pierce that same year. He received his doctorate in 1910 and joined the Harvard faculty the following year. 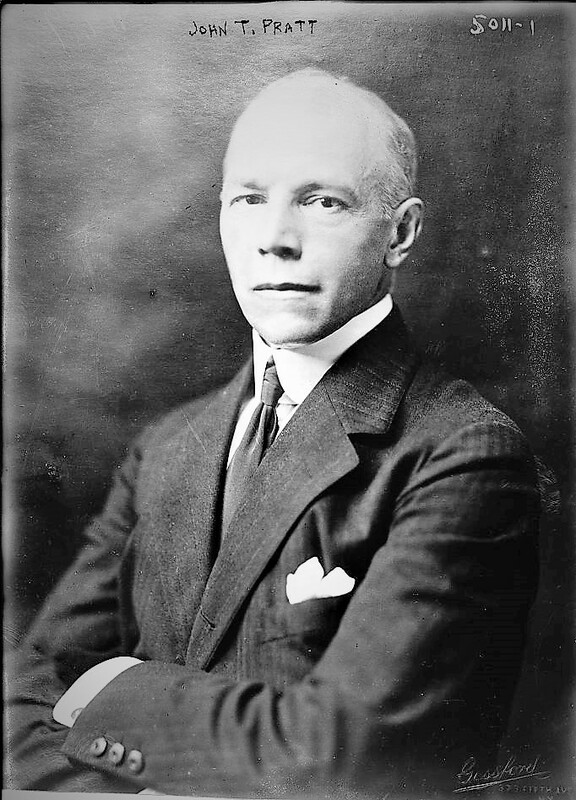 William Barbour normally appeared in the press because of business or political reasons. But on January 10, 1905 The New York Times ran the headline "William Barbour in Court--Arrested for Platform Spitting." Even some well-bred gentlemen chewed tobacco; but public expectorating was a crime and a grave breach of demeanor much decried by ladies. Why Barbour was taking public transportation that day is puzzling; however he was seen "spitting on the platform" of the Sixth Avenue Elevated Railroad at Franklin Street by Patrolman Ruppert of the Health Squad. When he was hauled into the Tombs Police Court, he was recognized by Magistrate Flammer who asked him how he came to be arrested. "I don't suppose a similar thing ever happened to me before," he said to the judge. "I am president of a company that makes millions of handkerchiefs a year, and yet I came downtown this morning without one in my pocket." The judge responded light-heartedly, "Ever hear about a shoemaker's wife going barefooted?" He discharged Barbour without a fine. A year later he was back in court. When he left the 53rd Street house on January 27, 1906 he was on the way to the Pennsylvania Ferry to catch a train for Cincinnati. And he was running late. 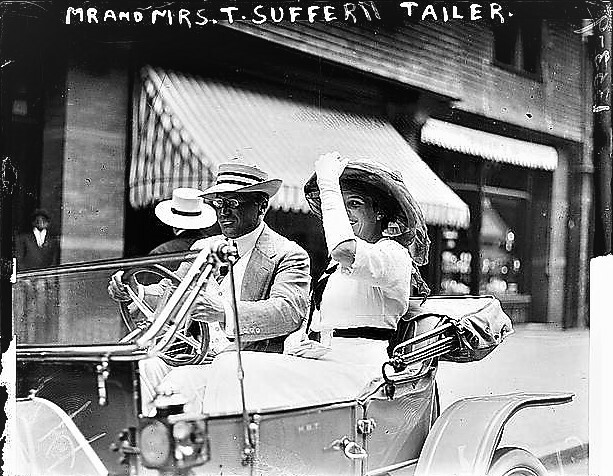 In the limousine with him were Thomas and Rosamond, who were visiting. Speeding down the Manhattan streets at 20 miles per hour, Barbour's chauffeur, Harry Wilson, only made it about 20 blocks. He was stopped by Traffic Squad patrolman Duane on Fifth Avenue around 33rd Street and arrested. 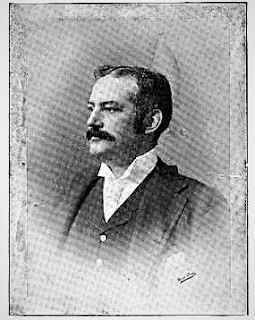 Barbour paid his chauffeur's $100 bail (about $2,750 today) but, according to a newspaper "Col. Barbour lost his train owing to the delay." 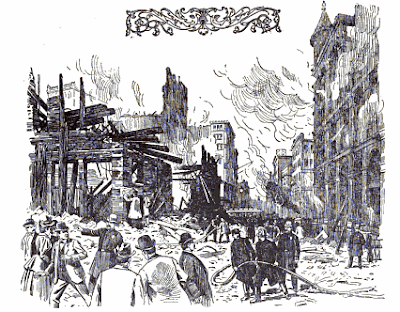 In August 1905 St. Thomas's Church on the corner of 53rd Street and Fifth Avenue had been destroyed by fire. Its replacement was delayed when the entire building fund was donated to the victims of the San Francisco earthquake the following year. But in the summer of 1910 construction was well underway and blasting for the foundations were shaking the surrounding mansions. Things got worse on September 7. After what The Times called "an unusually heavy blast" was set off. Massive rocks flew into the sky and fell on the palatial residences of 53rd Street. 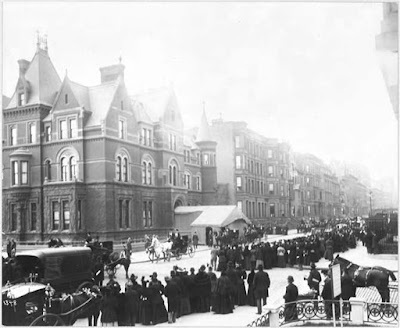 The newspaper reported "A shower of stones, some as big as paving blocks, fell on some of the best houses in the neighborhood of Fifth Avenue and Fifty-third Street at 5 o'clock." A big rock rose gracefully in the air and buried itself in the roof of a three-story extension in the rear of the residence of William A. Kissam at 9 West Fifty-third Street. Another was hurled across the street, through a window and into the drawing room of Mrs. Eben Wright." At the Barbour mansion and at those of his neighbors E. Parmelee Prentice and Benjamin Stern windows were shattered and glassware was broken. The Barbour family, like all their neighbors other than the Wrights, were still out of town for the summer. Only a small staff of servants was in the mansion. While her husband conducted his many businesses, Adelaide busied herself with social and charitable involvements. A descendant of Thomas Warren, who arrived in America on the Mayflower, she was a member of the Hugenot Society, the Colony Club, and the Society of Mayflower Descendants. She opened the house for charitable events like the meetings of the Nursery and Child's Hospital Sewing Class. On March 1, 1917 Barbour told his wife he did not feel well, but attributed it to indigestion. He went off to his office at No. 96 Franklin Street where employees noticed "he was not in his usual good health." His chauffeur picked him up at around 4:00. When he realized Barbour's condition seemed serious, he sped to the New York Hospital. Before he got there his employer was dead of a heart attack. 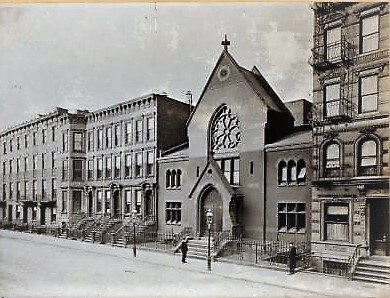 His funeral was held in the Central Presbyterian Church on Madison Avenue at 57th Street three days later. According to the New-York Tribune, his estate was valued at between $10 and $20 million--about 20 times that amount by today's calculations. The State of New York quickly took $200,000 in estate taxes; but the Barbour lawyers were just as quick to challenge that. The legal description of a state resident was "any person who shall have dwelt in New York State the great part of twelve consecutive months" prior to his death. The State pointed out that Barbour had spent 235 days in New York and 130 in New Jersey. The estate's lawyer's argued that the wording merely created a "disputable presumption" and that he was a New Jersey resident. Surprisingly enough, New York State lost the case and had to refund the $200,000. 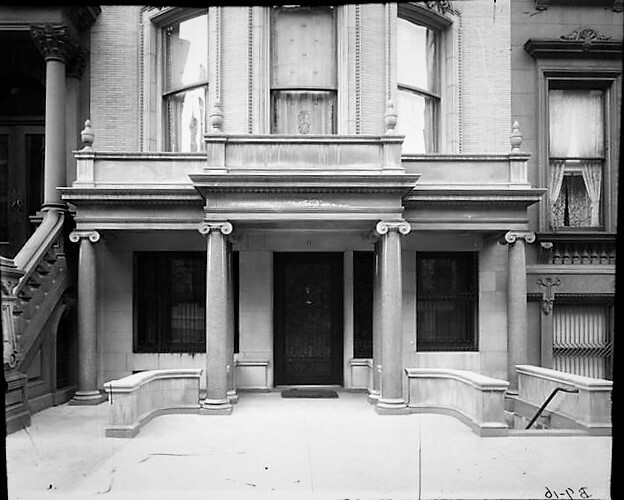 Adelaide stayed on in the 53rd Street mansion with sons Frederick and William, even as other wealthy homeowners moved northward. In October 1919 Frederick became engaged to Helen A. Carrere, the daughter of Louis Sidney Carrere and nephew of the famed architect John M. Carrere of Carrere & Hastings. Frederick had graduated from Princeton three years earlier. The couple's wedding in St. James's Church on Madison Avenue on February 17, 1920 was highly covered in the society columns. Thomas served as his brother's bet man, and Robert and William were ushers. Among Helen's bridesmaids was her unmarried sister, Elizabeth. The Sun reported that the newlyweds would live in the Barbour mansion. The following year, on September 25, The New York Herald reported "Another engagement that calls for more than perfunctory notice is that of Miss Elizabeth C. Carrere to Mr. William Warren Barbour. Their marriage, which is to be an incident of the winter, will form a double bond between their respective families." Already in-laws, the two were about to become spouses. 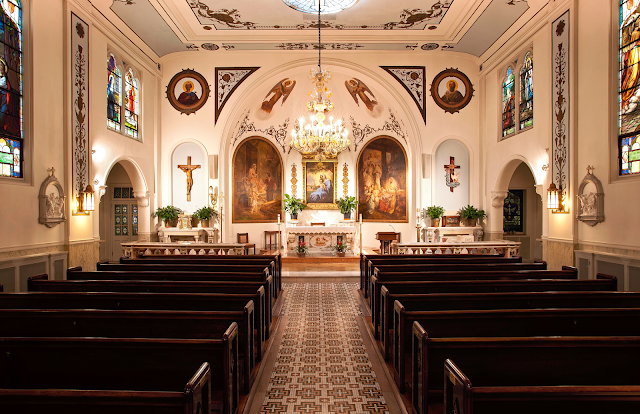 Their December 1 wedding, like that of their siblings, took place in St. James's Church. Adelaide continued her social routine. On January 5, 1922 she hosted the meeting of the Women's Memorial Roosevelt Association in the house. 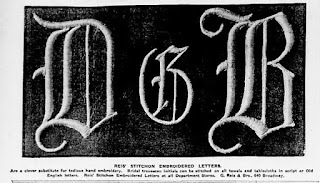 The Evening World reported "Thirty-one States were represented. There was a delegate from China." In the spring of 1923 she was taken to St. Luke's Hospital where she died at the age of 65 on May 9. Her sons wasted little time in disposing of the 53rd Street mansion and its contents. 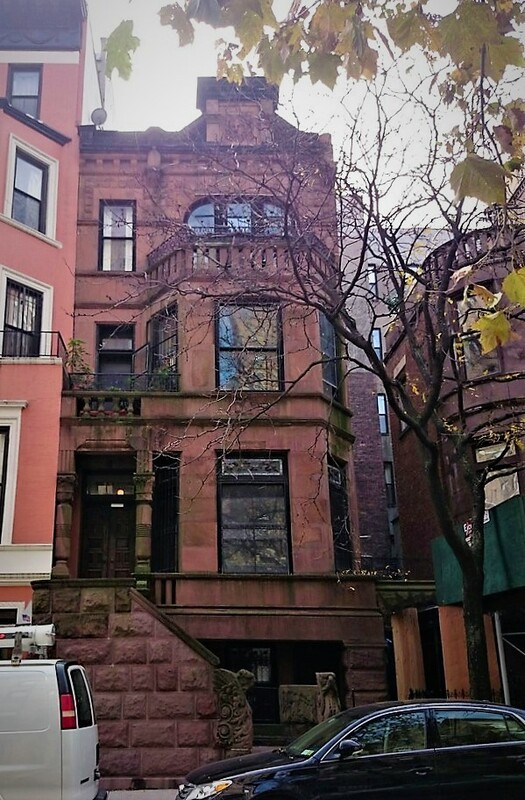 On November 13 an "unrestricted public sale" was held inside the house. The day-long auction saw strangers led from one floor to another. A 17th century French Gobelin tapestry "The Death of Hasdrubal" brought $1,000, and an 18th century portrait of Lady Cauldwell by Francis Coates was sold for $1,075--more than $15,000 today. 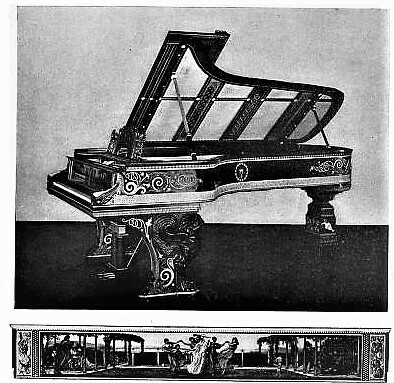 The highest price paid was $2,600 for the Alma-Tadema piano. It was purchased by Martin Beck for his soon-to-open Martin Beck Theatre. John D. Rockefeller, Jr. was at the time buying up all the available property on the block bounded by 53rd and 54th Street blocks and Fifth and Sixth Avenues. He added the Barbour house to his acquisitions and by the end of 1925 owned every building on 54th Street other than Nos. 18 and 26. In 1929 he leased the Barbour mansion to the Western Universities Club of New York as its clubhouse. Its lease would be short-lived. On December 2, 1931 The New York Times announced the the "five-story building" would become the home of the Museum of Modern Art by May 1. The Museum had leased space at No. 730 Fifth Avenue since its opening several years earlier. The formal opening came on May 3, 1932. The initial exhibition consisted of murals by American painters and photographers as well as the collection willed to the museum by Lizzie Bliss, one of its founders. Only five years later the Museum of Modern Art announced its intentions to demolish the Barbour mansion to make way for its new home. 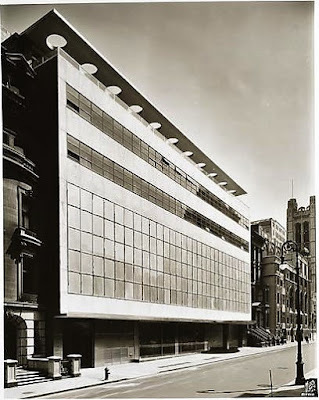 It was razed in 1939 and replaced by the International Style building designed by Philip L. Goodwin and Edward Durell Stone.